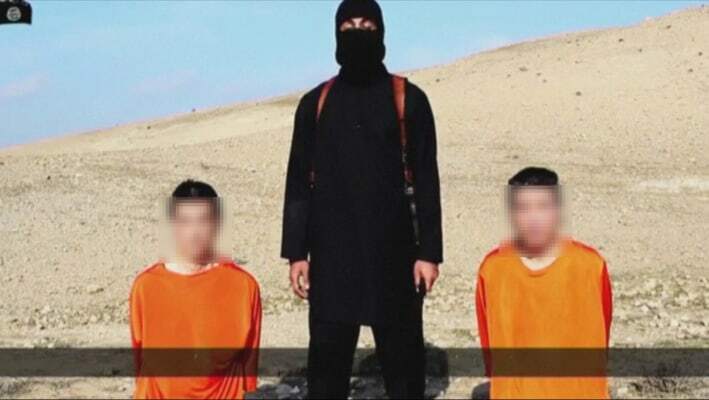 ISIS militants released a video purporting to show two Japanese hostages on Tuesday and demanded a $200-million ransom. Global security firm and NBC News counterterrorism consultant Flashpoint Intelligence said the video appeared to be authentic. It features two handcuffed men in orange garb similar to the jumpsuits worn by Guantanamo Bay detainees kneeling next to a masked jihadi who brandishes a knife. The militant said they would executed unless $200 million was paid within 72 hours. On Saturday, Japanese Prime Minister Shinzo Abe pledged about $200 million in non-military assistance for countries battling ISIS. The voiceover on the new video appears to be the work of the notorious "Jihadi John" — a militant with a British accent who is believed to have beheaded Western hostages. The ISIS video named the two men. However, NBC News was immediately unable confirm their identities. ISIS' al-Furqan media wing released a video message on Tuesday showing two purported Japanese hostages. NBC News has obscured their faces. According to Japanese public broadcaster NHK, one of the hostages launched what it described as a "civilian military company" in 2014 and is believed to have traveled to Syria. The other captive has been described as a freelance journalist who has posted reports from Syria on Twitter. His account has not been updated since October 23. At a news conference in Jerusalem on Tuesday, Abe demanded that the pair be "released immediately." He added: "Despicable terrorism can never be forgiven ... The $200 million aid which we recently announced, is to be used for people in the region who lost their homes, or to save refugees. It's a humanitarian aid to provide food and medicine." Yoshihide Suga, Japan's chief Cabinet secretary, described ISIS' threat to kill the hostages as "unforgivable" and said that Tokyo would "cooperate with related nations and do our very best to achieve the release of these Japanese nationals." ISIS has followed through on its promises to execute captives in the past. On Nov. 16, it released video showing that it had killed American aid worker Abdul-Rahman Kassig after beheading American journalists James Foley and Steven Sotloff earlier in the year. I think it would be a good time to show the world finally what we will do to those that threaten us. Oh wait, we would need a real leader to do that. I guess we'll just have to wait. I think they need to be hunted down and eradicated like the Nazi's of WWII anywhere they are found.